The Kansai region of Japan is full of privately owned railway companies. Many of them are more than just railway companies, though. The railway operations may only be part of a larger conglomerate of companies. Many of the railway companies also have related major department stores. So often these rail lines run from their department stores in the middle of Osaka to another branch in an outer suburb. I guess it makes a lot of sense to build your own private rail line to help carry customers right to the front door of your store. Many of these companies also have large real estate holdings. For example, at Universal City just outside Universal Studios Japan, you can see that some of the tall buildings are owned by the rail companies. Company names like Keihan and Kintetsu are printed boldly across the side of a couple of the buildings. Because of the number of companies that operate in Kansai, it can be pretty expensive to travel on these lines. It’s especially expensive when you switch from one carrier to another because you have to pay all over again. We did some research beforehand and discovered the Kansai Thru Pass. What is wonderful about this pass is that it gives you unlimited travel on almost all the lines of these private rail companies plus the Osaka Municipal Subway for the duration of the pass. There are the options of a 2-day or 3-day pass. The 2-day pass costs ¥3,800 and the 3-day pass costs ¥5,000. The pass must be purchased at select locations. If you’re flying into Kansai, then it’s best to buy it right at the airport. 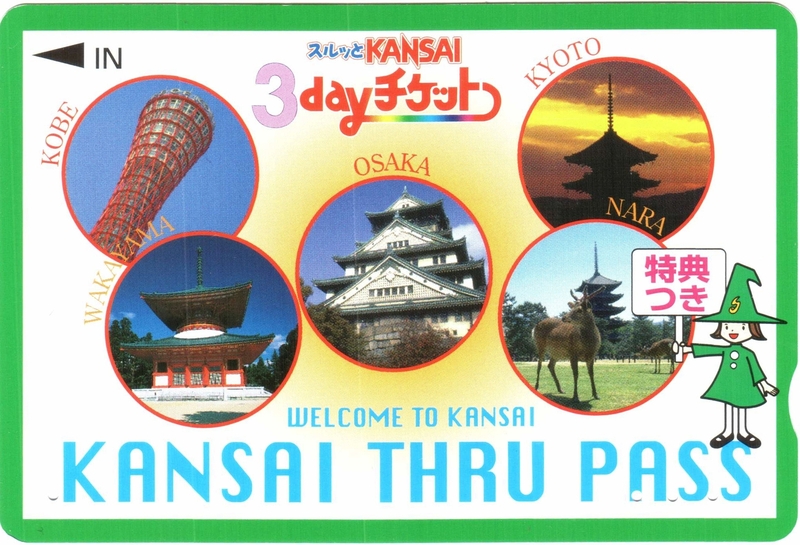 The Kansai Thru Pass also gives you coupons to use at select locations, like a tourist attraction. Sometimes you get a small discount or you get a small complimentary gift. These coupons are only good on the days that you are using the pass. Hankyu Railway may not be one of the largest rail networks in Kansai, but it certainly has the most distinct fleet of cars. 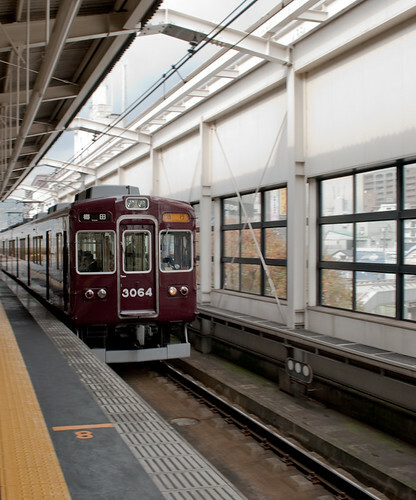 Maroon is the signature colour of the Hankyu fleet. It’s impressive to see all the Hankyu trains lined up platform after platform in a sea of maroon. Hankyu trains run mainly out of Umeda in Osaka. The department store by the same name anchors Hankyu’s Umeda Station and is a busy centre of activity. Trains heading west out of Umeda are usually Kobe-bound. Heading to north and west is the Takarazuka Line. Then heading out east and north are trains that head into Kyoto’s downtown core. The two Kanji characters for Hankyu represent Osaka in the first character and express or quick in the second character. So you could loosely translate Hankyu as the ‘Osaka Express’ company. We had taken the Hankyu train to go from Umeda in Osaka to Ikeda along the Takarazuka Line. We were going to the Instant Ramen Museum. An impressive and professional facility that looks like it has the major financial backing of Nissin Corp. The place definitely caters to kids and school field trips, but it’s still worth a visit if you’re looking for something different or just love all things Japanese. The Takarazuka Line was also our way to get up to Arima Onsen (hot springs). The train didn’t go all the way up the mountains to Arima, but we were able to take a Hankyu Bus from Takarazuka up the mountains to the hot springs. The Keihan Railway system serves Osaka, Kyoto, and Shiga areas of Kansai. The name Keihan is combination of the first character for Kyoto and the last character for Osaka. So literally, it’s the Kyoto-Osaka Railway company. Keihan has one of the newest train lines in Kansai called the Nakanoshima Line. It’s a 5-station spur line that branches off the Keihan Main Line between Umeda (Osaka) and Kyoto. It opened in the fall of 2008 and has some beautiful stations. Nakanoshima is an island in the middle of Osaka that is famous for some of its old European-style building and its finance district. Unfortunately, I didn’t actually get a chance to ride this line. I didn’t want to force my wife on detour just to ride this train. We used one of the outlying lines of the Keihan line that took us from Uji to Tambabashi station. We had to transfer at Tambabashi in order to get to Kyoto Station. 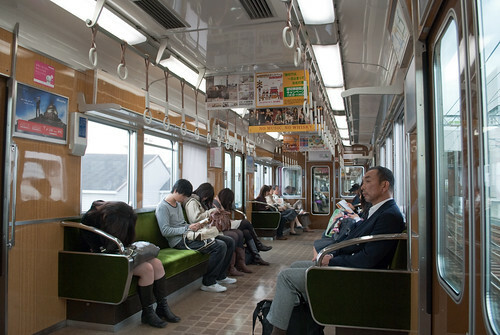 We got on one of the older Keihan trains decked out in Keihan green. We also used took a different Keihan train from Kyoto Station back to Osaka. We were using the Thru Pass that day, so we had to be smart about which way we travelled as not to be charged extra. Kintetsu Railway is sort of a short form Kinki Rail. Kinki is one of the names that is attributed to parts of the Kansai region. There is even a Kinki University (and yes, I can imagine some of you are snickering now about the name). Kintetsu has a multi-line network that covers Osaka, Kyoto, Nara, Ise, and even Nagoya further east. 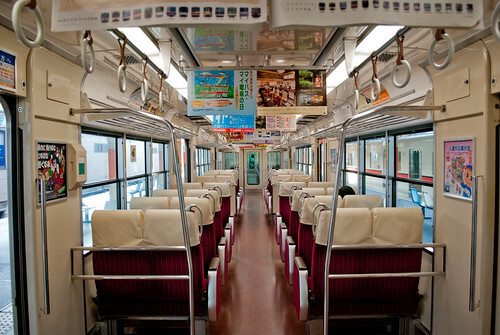 It has a variety of regular trains, but a few limited express trains that cover their network. 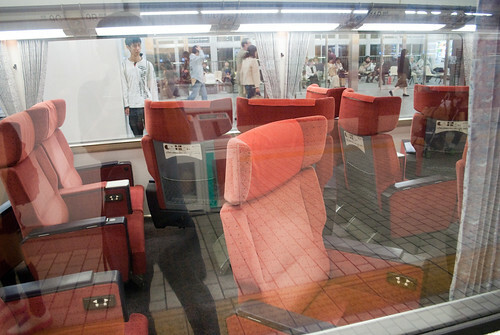 Nagoya is pretty far, so you better have a comfortable ride on the train. We used Kintetsu a couple of times. One time, we used it to travel directly from Osaka to Nara. Kintetsu’s Nara station is even more central that JR’s Nara Station, so it made sense to go with Kintetsu that day. Also, we were using our Kansai Thru Pass again. Later that same day, we caught a Kintetsu train when we transferred at Tambabashi Station to get to Kyoto. We really lucked out because we ended up getting on the Ise-Shima Liner. 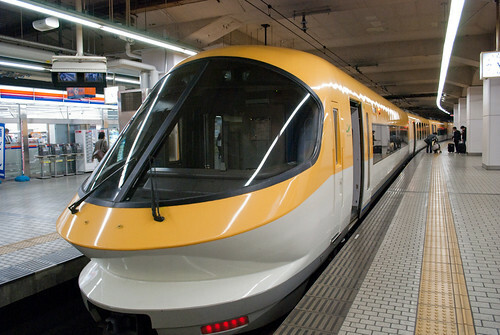 It’s a Limited Express train decked out in a sleek yellow and white colour scheme. We had regular seats that were still comfy, but when we got off, we could see that the first class car seats were extra comfy and they even automatically swiveled around to prepare for the passengers heading in the other direction. Now that was fun to watch the seats change direction. You know you are a transit geek when get excited about how the seats change direction on a train. Hanshin literally means Osaka-Kobe. The kanji for Han is taken from the second character in Osaka and the kanji for Shin is taken from the first character for Kobe. So Hanshin Railway is the Osaka-Kobe Railway company. It’s main line runs from Kobe in the west to Osaka’s Umeda or Namba Stations in the east. 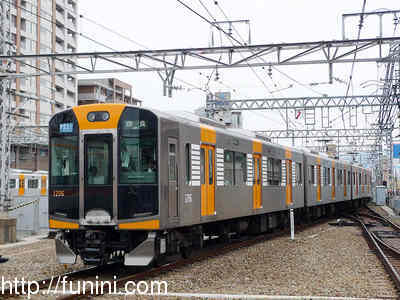 It also shares service with Sanyo Electric Railway for service to Himeji and with Kintetsu Railway for service to Nara. 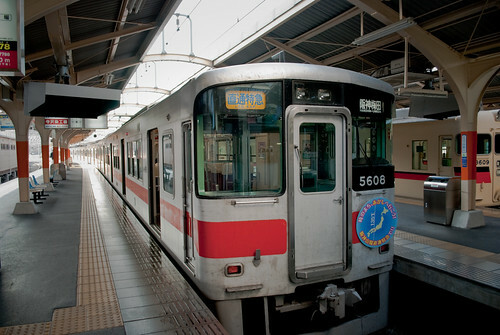 From our experience with Hanshin, we used it as our primary means of travel between Kobe and Osaka. We were using our Thru Pass, so this line was the best line to take with the pass. The Hanshin Sannomiya Station in Kobe is really convenient. There is a lot of food around the station. Too bad we were way too tired to walk around and take in more of the sites. We took advantage of the many coin lockers near the Hanshin Station the day we went out to Himeji. Without the lockers, we would have had way too much to carry. Given the proximity of Kobe to Osaka, you can tell that these trains are really meant to be daily commuter trains. You could imagine people living in Kobe and travelling everyday into Osaka for work. When we first were planning a side trip out to Himeji Castle, we were debating whether to take the JR Train or the Sanyo Electric Railway. We weren’t travelling with a JR Pass and we were thinking of using our Kansai Thru Pass if possible. 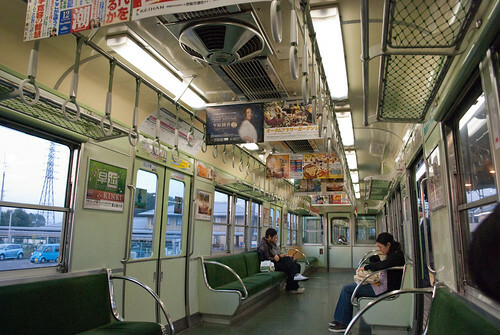 The Sanyo Electric Railway’s Himeji Line is one of the lines covered by the Thru Pass. Initially, I was concerned that the ride was going to be unbearably long, but thankfully we caught an express train. If we didn’t get one of those, I think I would have been pulling out my hair (not that I have much left anyway). The 45 minute ride on the express was much better than the 1.5 hours on the regular milk run. Now the Sanyo name, as far as I know, is not related to the electronics company (however, I could be wrong). Sanyo is definitely a name associated with the region around Himeji and beyond. The company seems to only run one line from Kobe’s Sannomiya area to Himeji city with a spur line to another city in the area. 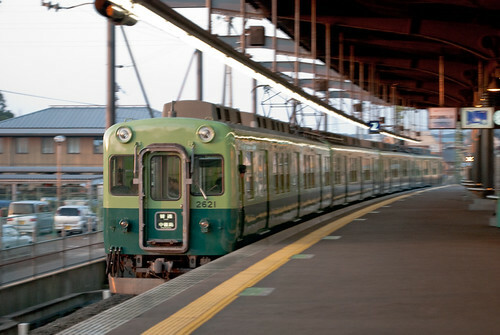 Some of the trains on this line are shared rides with other companies like Hanshin Railway. As for the ride itself, it was very comfortable with forward-facing seats with high head rests. I definitely could catch some z’s on this train. Plus, the view of the Pacific Ocean is stunning when the train runs between the outskirts of Kobe to Akashi city. When you arrive in Akashi, you are greeted by the giant Akashi Bridge. It’s the world’s longest suspension bridge. The train ride is probably worth it for the view alone, but Himeji Castle is also well worth the visit. On the late morning of March 10, an incredible event occurred on the opposite side of the world. It all began with three 14-year-old kids, two boys and a girl, playing around on the side of the crowded streets of Osaka, Japan. The carefree adolescents were giggling and lightheartedly pushing and shoving each other on their way to downtown. When they reached the train station they paid no mind to the disapproving looks they received from awaiting train riders and tourists in the loading area. The three didn’t stop their almost mischievous behavior as the rapidly approaching train was now in sight. Not knowing his own strength, the tallest boy thrust himself into the other boy who nudged the petite girl just enough that she couldn’t regain her balance. Instinctually, she grabbed her friend’s shirt as they both unwillingly jumped onto the magnetic rails of the bullet train nearly two meters below the station’s platform. As if captured from a scene in a movie, one of the world’s fastest trains was only seconds away. In horror, the fallen boy scrambled to get out and the crowd cried as the train was only a few short meters from disaster. People were panicking as the boy’s left arm was being pulled up by two men as if he was a stuffed animal. The young girl still lay still. For her, it was too late. In an instant, the train had arrived to the station as it had thousands of times before. But this time it was different. The first train car was unhinged from the rail and had veered off to the right at a 45-degree angle. The crowd became silent as they held their breath. Only about 15 centimeters (6 inches) separated the young teen from her deplorable death. The girl was carried away with only a twisted ankle, some bruises, and a broken smile. Strangely enough, investigators found that there were no other similar accidents ever reported within that railway system and the train conductor could not have possibly braked in time. It was believed that an object disrupted the train’s path. In all of the hysteria just before the train was stopped, many people had thrown objects such as garbage cans, purses, belts, and even newspapers onto the rail. However, only one of the items was the source that challenged the powerful train. An innocent left-sided flip-flop sandal adhered to the track at the point where the train derailed. Nearly unidentifiable, the only thing that was recognizable on the object was a “Rider” logo that matched a right-sided sandal found below the platform. Pingback: Japan Trip – Kyoto (Part 1) and Nara – Oh, She's Back!